Home / Vascular Disease / Whatâ€™s new in Vascular Surgery? Whatâ€™s new in Vascular Surgery? Most abdominal aortic aneurysms (AAAs) can now be repaired completely percutaneously using endovascular stentgrafts without the need for any incisions or wounds. This minimally invasive procedure is performed via a needle in each groin and can be safely performed under general, regional or local anaesthesia depending on the patients preferences and co morbidities. An AAA occurs when the wall of the aorta progressively weakens and begins to bulge. This bulge can continue to enlarge and eventually rupture if left untreated, causing severe internal bleeding and possibly death. This can condition occurs in both men and women and usually has an underlying genetic basis. Smoking, increasing age and a family history of aneurysms are the biggest risk factors. Unfortunately most individuals with AAA are not aware of their condition as the aneurysm is asymptomatic in the vast majority. Most cases are discovered incidentally or by pure chance on abdominal scans performed for other reasons. This is why at Specialist Vascular Clinic, we offer screening for AAA targeted to men over the age of 50 who have smoked sometime during their life and to both men and women who have a family history of AAA or any aneurysm. The screening involves an ultrasound scan that is a quick, painless, safe and accurate way to detect AAA. When an AAA repair is being planned we use sophisticated spiral CT scan technology to help plan a customised stentgraft that is designed to fit the patients particular aortic anatomy. This modular type of stentgraft design allows each component of the repair to fit precisely into the aorta as intended in order to seal off the patients aneurysm from pulsatile blood flow. The endovascular stentgrafts are usually introduced from the femoral arteries in the groins. Once accessed via a needle a guide wire can be placed inside the aorta and the stentgrafts are telescoped over the wire and thus introduced into the patients aneurysm. Once in the correct position as confirmed by angiography, the devices are opened in a controlled fashion ensuring precise anatomical deployment. 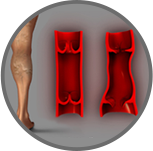 At the conclusion the previously inserted closure device is used to close the femoral arteries which allows the entire procedure to be performed without incisions or wounds. This has significant advantages for the patient who can rapidly resume normal activities following the procedure. This has led to significant reductions in hospital length of stay, time to resume ambulation, time to return to normal pre-admission activities. Figure 1 shows a typical CT scan appearance of an AAA as a bulge or dilatation of the aorta just below the level of the kidneys and just above the level of the aortic bifurcation. The green line is a centreline of flow analysis being performed to help plan the construction of an endograft that will allow an endovascular repair. This line is also the line that the device will follow when introduced from the femoral artery and deployed in the aorta. 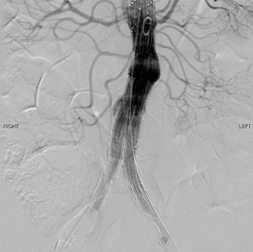 Figure 2 shows a typical appearance of an AAA at angiography. This is the view of the aneurysm the surgeon works with during the endovascular procedure to repair the aneurysm. 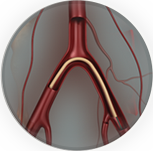 Figure 3 shows the endovascular stentgraft in the correct position and being deployed during the implantation procedure. 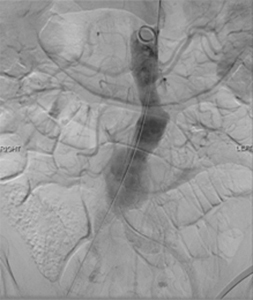 Figure 4 reveals the completed angiographic appearance of a successful endovascular AAA repair with excellent flow in all the renal arteries as well as all the iliac arteries and with no blood flow in the aortic aneurysm. 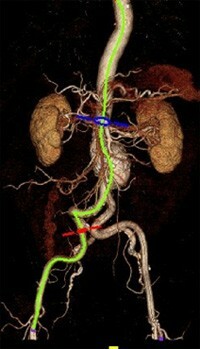 The aneurysm sac has now been excluded from the arterial circulation and is monitored in follow up as it shrinks in size. Endovascular therapy using commercially available stentgrafts is frequently utilized to treat infrarenal abdominal aortic aneurysms (AAA). Large randomized trials have shown this minimally invasive technique to reduce the mortality rate associated with repair from ~5% with open surgery to ~1% with endovascular aneurysm repair (EVAR). However, when the aortic repair involves the renal arteries or the visceral segment of the aorta, operative risks for open surgical repair are significantly higher with mortality rates of 10-30%. There are also more risks to consider including risks of renal ischaemic time leading to renal failure, bowel and hepatic ischaemia, as well as paralysis from spinal cord ischaemia. These risks are highest for patients that present with thoracoabdominal aortic aneurysms (TAAA). Operative results for open repair of TAAA correlate with surgical volume of both the individual surgeon as well as the institution. In high volume open surgical centres in the USA, mortality rates range from 10-15%. However, when the results all centres are pooled, the surgical outcomes are much more sobering. A recent state wide audit in the US state of California showed open TAAA had a perioperative 30 day mortality rate of 19% and at 1 year post repair only 69% of all patients were still alive. Thus, it is this group of patients with more complex aortic disease associated with very high perioperative morbidity and mortality from conventional open surgery that will derive the greatest benefit from endovascular therapy. Endovascular therapy has the potential to not only reduce the morbidity and mortality of aortic repair but also allows treatment of a large group of patients that were previously considered 'inoperable' or 'too high a risk'. Several centres from the United States and Europe have already reported promising early as well as midterm outcomes from this form of therapy for complex aortic disease. At the highest volume centre for endovascular therapy for complex aortic disease, the Cleveland Clinic, in Ohio where Dr Mohabbat completed his sub specialty training, greater than 1200 aortic aneurysms are repaired annually. They began treating juxtarenal AAAs with fenestrated stent grafts in 1999 and have published midterm follow up data on their patients. Their results demonstrate that juxtarenal AAAs can be repaired with a mortality rate of < 3% at and TAAAs can be repaired with a mortality rate of < 10%. 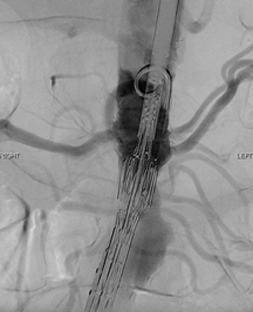 In follow-up the device is stable, the vast majority of patients aneurysms continue to reduce in diameter, and renal and visceral complications are uncommon. Today, there are no true contraindications to endovascular repair, instead it is the risk/benefit ratio of each possible treatment option that must be considered for individual patients. 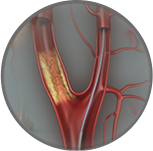 Patients with complex aortic disease have the most to gain from endovascular solutions. Surgeons who desire to implement these new technologies should ideally have subspecialty training in this field and be proficient with image interpretation, manipulation, endovascular grafting of the infrarenal aorta, and renal and mesenteric stenting prior to embarking on complex aortic procedures. Devices will become more complex and will be mated with additional small vessel stent grafts. However, clearly, the benefit of these technologies for this patient population are marked, and physicians must place great emphasis on the support of these technological developments and methods by which these skills can be disseminated. 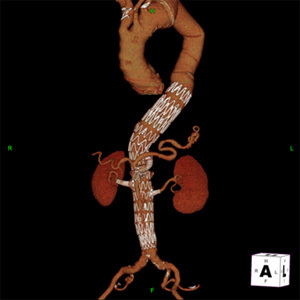 Figure 5 reveals the CT scan appearance of a patient with a thoracoabdominal aortic aneurysm treated using a helical directional branched endograft with fenestrations for the renal arteries. There is excellent perfusion of the visceral branches of the aorta including the coeliac artery, the superior mesenteric artery (SMA) and both the renal arteries with excellent nephrograms visible on this 3D CTA reconstruction. There is also good flow into both iliac arteries as well as exclusion of the aneurysm sac with no evidence of Endoleak demonstrating a successful pure endovascular repair for this challenging surgical condition.